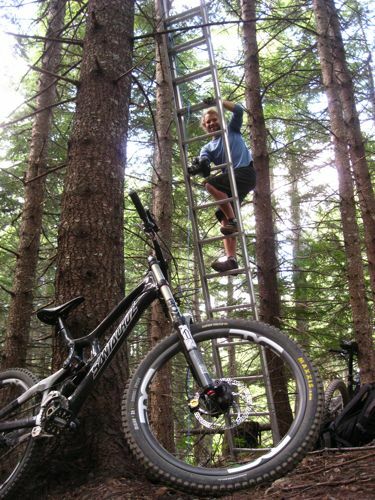 Jordan Manley, a huge ladder, and a Carbon V-10. Was today an amazing day? You bet your arse it was. Whistler ,BC. 24th June 2010. I will remember this date for along time to come, and for two excellent reasons. Firstly, I got my grubby mitts on a Carbon V-10. Secondly, I had the opportunity to meet and work with uber photog dude, Jordan Manley. I’ll make this brief as it’s almost midnight and I’ve only just got in from having my mind melted on the trails of the Bike Park today. I need to sleep so I can be up early to do it all over again. Santa Cruz Bikes have been hosting a bunch of engineers and media in Whistler all week giving them some trail time aboard the brand new carbon V-10 (or v-10.4). Spoke didn’t get invited but I did manage to slip in the side door and get some time aboard this machine. I will try to save my blushing love crush psycho babble of this bike but I will say that it does make you faster…alot faster. The cherry on the top was being told that Santa Cruz needed some more photos and so hooked Jordan Manley and myself up together for an afternoons schralping and shooting. I’m not sure if Jordan Manley is know that well in NZ, so if you aren’t acquainted with his work then check HERE and then click HERE. This is the wonder kid of photography that has other legends of shooting describing him as “intimidating” and has won the Deep Summer photo contest three times in a row and will be turning his eye to the Saint Deep Summer photo contest in August. So when I meet Jordan and he tells me he has a shot in mind that requires a giant ladder and a specific time of the day to grasp the correct light in the trees, I pretty much giggled like a schoolgirl and fawned. We spent a great afternoon shooting dusty berms in fields of green whilst bears wondered into shot as if on queue, then an evening deep in the woods trying to push a berm back a couple of inches. It sounds super gay (can I say that word on Spoke?) when I say it like that but hopefully when the images pop it won’t seem so fruity. I rode the same bike that Spomer had been riding earlier in the week. It weighed 33.5lbs without pedals. Click here for Spomers early report on VITAL. There’s far more details about this incredible machine there. June 24, 2010 in Uncategorized.